Samsung Galaxy S 4 reviewed: Too many features or just right? The fourth iteration of Samsung’s Galaxy S arrives soon in the U.S, starting at $149 down (T-Mobile), $199 (AT&T(s t)), $249 (Sprint) and Verizon(s vz)(s vod) (Price TBD). The smartphone looks much like its predecessor on the outside, but make no mistake about it: The Galaxy S 4 is Samsung’s most advanced smartphone yet. That’s good for power users, of course. Too many features, however, can confuse the masses, leaving people with a complicated experience. Has Samsung delivered something for everyone? I spent a week with the Galaxy S 4 to found out. To be sure, there are more software functions in the Galaxy S 4 than any smartphone I’ve used yet. That includes the new HTC One, which is feature-packed in its own right. When Samsung launched the phone, this should have been obvious: At the launch event that I live-blogged, my fingers couldn’t keep up with the presentation. That’s because most of the innovation is in Samsung’s software, although the hardware shows improvement from last year’s phone. If I were to hand you a Samsung Galaxy S 4, you might actually mistake it for a Galaxy S 3. That’s not a bad thing if you liked the prior design. The phone is still mostly plastic and has a removable cover. Samsung told me that customers want the flexibility of an SD card slot and replaceable battery; the polycarbonate plastic allows for this. 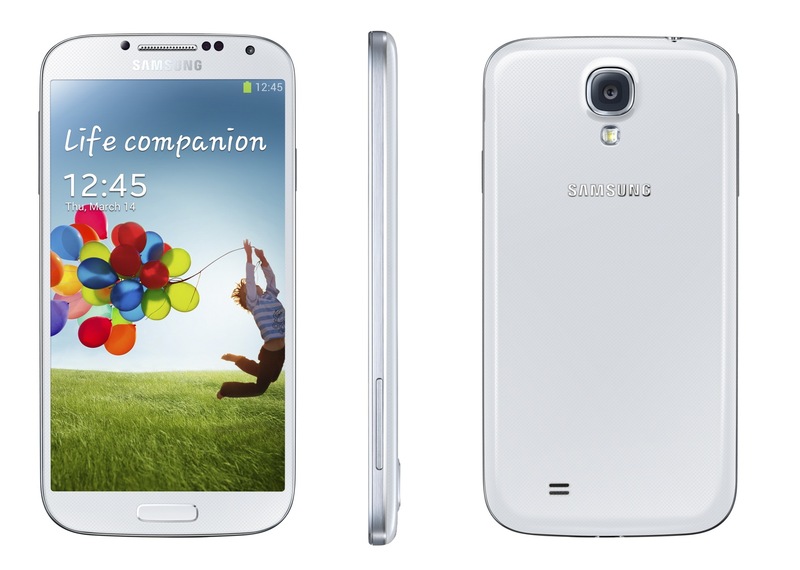 The dimensions of the Galaxy S 4 are also very similar to last year’s phone. It’s actually the same length and width, but slightly thinner, and yet it has a larger display: 5-inches compared to 4.8. Still, the phone weighs 0.1 ounces less this year. The biggest noticeable difference is the screen. Not because it’s 0.2-inches bigger, but because it’s a full-HD (1920 x 1080) display with 441 pixels per inch. The clarity is stunning, particularly for images and videos, although text is crisp as well. Samsung’s Super AMOLED technology has improved also. Colors don’t appear over-saturated as they did in prior Samsung handsets. Samsung chose to use the same button layout on the Galaxy S 4 as it has with recent Samsung devices. As the owner of Galaxy Note 2, for example, I’m already used to the volume rocker on the right side of the phone with the power button on the right. A headphone jack and microphone input are on the top of the Galaxy S 4, while another microphone and micro USB port are on the bottom. A hardware home button and two touch areas for Menu and Back are below the screen. A 13 megapixel camera with LED flash sits in the center of the phone’s upper back area — the front has a 2 megapixel sensor — and a speaker is at the bottom left of the back. Pulling off the removable cover provides access to the 2600 mAh battery, micro SD card slot and SIM card. The phone could potentially support wireless charging in the future but that feature hasn’t been announced for the U.S. I was able to routinely get through a full day on a single charge with the device. Here in the U.S., Samsung is using Qualcomm’s(s qcom) quad-core Snapdragon 600 chip clocked to 1.9 GHz, paired with 2 GB of memory. It’s a potent combination and the handset never exhibited any lag in my testing; even with several apps running in the background. I’ll leave benchmarking to others. Suffice it to say, if there’s a faster Android phone on the market, I haven’t seen it. There aren’t any missing connectivity options here either: Samsung has loaded the Galaxy S 4 with just about every type of radio you could want. The LTE handset includes 802.11 a/b/g/n/ac support, Bluetooth 4.0, NFC, and GPS. Files can be sent wirelessly through NFC and Wi-Fi Direct — just tap the Galaxy S 4 to another compatible phone — while media can be streamed over Wi-Fi to an HDTV. You can even play a song on multiple Galaxy S 4 handsets, using each phone as an independent speaker with Samsung’s Group Play app. Phone calls on my Sprint(s s) review unit were clear, both in the hand and on speakerphone. I don’t live in a Sprint LTE area, so I couldn’t test that service. (Note: That could have affected my battery life tests as LTE handsets can use more power than 3G devices.) Instead, I was relegated to a much slower 3G experience. I do have an 802.11ac Wi-Fi router, however, and was able to get full wireless speeds from my home broadband, which is a 75 Mbps FiOS connection. I can’t stress enough that while the hardware is nice, the Galaxy S 4 is chock full of software features that push the experience in a positive direction. Android 4.2.2(s goog) is the base operating system that Samsung builds its TouchWiz user interface upon. Simply put, TouchWiz has evolved as a powerful software environment that contains so much functionality that Samsung has had to put a tabbed interface in the Settings. In fact, if you enabled all of the buttons in the Notification panel — think one-touch buttons for Wi-Fi, Sound, Bluetooth, etc. — you’d have 19 options to choose from. That’s because of the Samsung-specific features. Smart scroll — When the phone detects your eyes, you can tilt your head or the device to scroll. It took me a few minutes to get used to this function, but after a short while, I was able to get it working well. Multiwindow — Just like on my Galaxy Note 2, this lets me run two apps at one time. The choice of supported applications is limited, however. S Beam — A function that’s not new to Samsung phones, but can be handy. Tap your phone to another NFC handset and you can transfer files wirelessly. I’m calling special attention to two specific features because they’re truly innovative and unique to the Galaxy S 4: Air View and Air Gesture. If you’ve ever used a tablet with digital pen, you’ve seen an on-screen cursor when hovering the pen over the display. Air View is akin to that except no pen is needed. Instead, you simply use your finger over the screen for the same functionality. This “magic” is thanks to the Synaptics ClearPad and its “3D-Touch” feature. Using your finger up to 2 centimeters from the screen then, you can hover over an app and drill down to see more information. Hover over a day in Samsung’s S Calendar, for example, and instead of seeing just part of your appointments, all events pop up until you move your finger. You can also use this to preview the contents of email without actually opening the mail. It’s quite handy, not to mention impressive. Air Gestures are a related feature. When enabled, you can swipe through information simply by waving your hand over the phone. I used it extensively to navigate through my photo gallery without ever touching the phone. In Samsung’s browser, you can also swipe or scroll up and down on a web page with gestures. 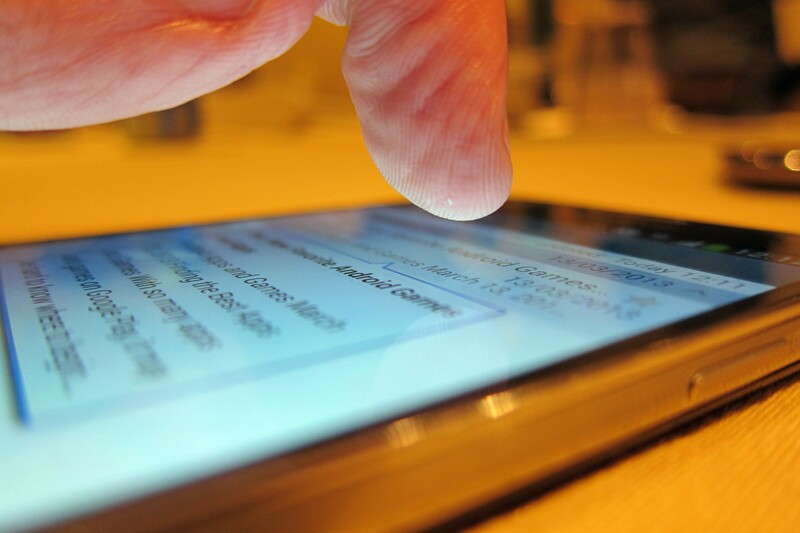 Since the phone uses infrared sensors for this feature, your hand can be several inches from the phone. Unfortunately, both of these features are limited to the Samsung apps with the exception of Flipboard: You can hover over a topic to see the top three stories related to it. Samsung said it will be working with additional software partners to enable the gestures. I’d love to see Amazon(s amzn) get on board so I could turn the pages of my Kindle book without touching the phone. Also new to the Galaxy S 4 is the new Samsung Hub — a one-stop digital store for music, video content, ebooks and games. The store is nicely done and ties to a Samsung ID, similar to how Apple runs the iTunes store. Samsung Link makes it easier to share content across tablets and televisions while also acting as a cloud storage service. Story Album is another new addition: With it you can make small photo albums and order hard copies for a fee. S Translate does exactly what you’d expect, helping to translate languages in Samsung’s communication apps; it even speaks aloud the translation. An Optical Reader app uses the camera to scan in text from a picture and smartly saves the information in the appropriate format. Snap a pic of a business card, for example, and the software creates a contact record from the data. 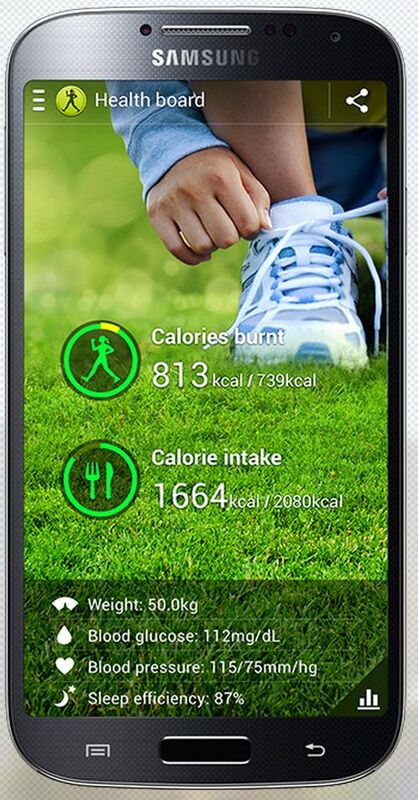 Samsung calls the Galaxy S 4 a “life companion” and part of the reason is a new S Health application. It’s software that tracks your exercise, weight, health goals and nutritional habits. Samsung will also be selling accessories to supplement the S Health app: Look for an optional heart rate monitor and pedometer band. The software is nice, but I think there are more robust third-party options available. WatchOn, powered by Peel, is also included. With it you can control a television set or set top box — the phone has an IR blaster — and the content guide is quite good. It’s easy to find out what’s on television through the phone and immediately see the content. On select Samsung televisions, the software also allows you to watch the television programming on the phone itself; handy if you have to leave the viewing area while others are watching. Don’t go too far though: The content is streamed over your local Wi-Fi network. I’ve broken out the camera experience into a separate area because there’s so many scenes, modes and functions. Overall, I found the Galaxy S 4 camera to be quite good for both stills and HD videos in nearly every situation. Some HDR shots were marginal and low-light capture is good but not great. As an “all arounder”, most will be happy with the camera, which uses the same interface as Samsung’s digital cameras. Best photo — A quick burst of 8 photos is taken and the camera suggests which is the best. You can choose a different one if you want but the Galaxy S 4 is quite good at picking the best image. Best face — A 5 image burst that lets you mix and match the best face from each of the subjects, which works really well. Sound & shot — I don’t think I’d use this often, but it allows for a brief capture of sound to pair with an image. Drama — This mode is impressive. You have to hold the camera very steady to use it because it captures a moving subject. With a static background, the image shows the subject several times in the same photo. Think of capturing a diver in motion as he falls from the cliff: One picture of the cliff but the diver can be seen at various points in the dive. Animated photo — You can turn a standard photo into an animated .gif, controlling what part of the photo is moving. Eraser — Another nifty feature. The camera takes five images and then detects if anything is moving. If so, you can choose to “erase” the object in motion. That’s handy in case someone walks in front of or behind your subject. Since the camera has the image background through the five photos, you can remove objects in front of it and the camera will seamless stitch in the background. Good bye photo-bombers! Dual camera — This feature uses both the front and rear camera at the same time, allowing you to insert your own face into a photo. You can customize the frame around your face or move it around your photo so you don’t block the main subjects. If it’s not yet clear that the Galaxy S 4 is feature packed, let me assure you: I’ve only briefly touched upon most of the major features. You’ll likely find more if you take your own look at the phone. So is this a problem to the casual phone user? Perhaps, but Samsung has an improved Easy Mode for these folks. Easy Mode is what it sounds like: A simpler interface with larger buttons that show the most likely used apps and features. In fact, some of the advanced functions aren’t even accessible in Easy Mode. At first, I didn’t like that idea, but I’ve come around to appreciate it. Why? It gives new smartphone users a way to “graduate” to the full-featured Samsung experience without them having to buy a new Samsung phone. 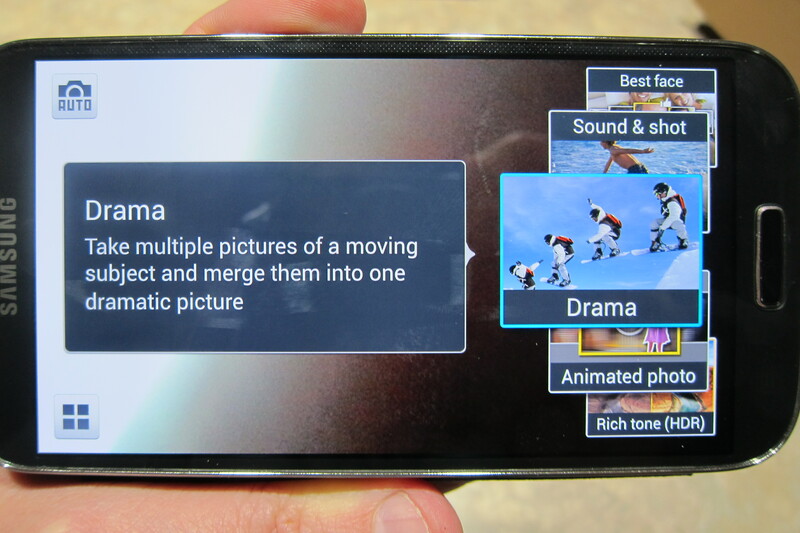 Many of the advanced features have useful pop-up descriptions as well; all of the camera modes have them, for example. You can always tell the phone to stop showing these once you’ve learned the functionality. Would I recommend the Samsung Galaxy S 4? Yes, without hesitation. It’s speedy, runs all day on a single charge, and has a wonderful display. It also offers a removable battery and expandable memory, which not every phone does. I’d like to see a little more innovation in the hardware design, but it’s a design that actually works well, so it’s difficult to complain about. Samsung does have an innovative cover accessory though. It’s called the S View Cover and I love it. It protects the display but has a cut-out window that shows information from the phone; you can even take a phone call without opening it. Even though the Galaxy S 4 looks much like the model it replaces, this phone is a big step up thanks to the innovative software features and functions that Samsung has integrated. No phone is perfect for everyone, of course. I think most people, however, would be happy to have this device in their pocket. Last year, I called the Galaxy S 3 “Android’s defining phone.” This year, I’m calling the Galaxy S 4 “Samsung’s defining phone” due to the Samsung-specific software features that differentiate this model. Update: This post was updated at 5:04 am, April 24, to correctly state the Snapdragon chip has four cores. Nice case, but I would recommend the Pong Research Samsung Galaxy S4 case over this. Studies conducted by numerous scientific teams in several nations have raised concerns about the possible association between heavy cell phone use and health problems. That’s why I did research and found a case that can reduce radiation exposure. In the end though, I found a couple of reviews of Pong Research ‘s cases, that convinced me to give it a try. This case is built with an antenna in between layers of the back cover, which reduce exposure to radiation. Because Pong is the only technology proven in FCC-certified laboratories to reduce the exposure to mobile device radiation by up to 95% below the FCC limit without compromising the deviceâ€™s ability to communicate. When you start up the phone apparently you need to login to your google account, samsung account and AT&T account. Does the phone run without any problems i just login to Google and ignore the rest? I have the samsung s II but im thinking about making the switch should i? This is d best fone eva!!! Actually the power is on the right, the volume is on the LEFT. This phone is so awesome. Soon i will have it in my hands but once more the back cover is not the best and you can’t use it withaout a case.. One drop and you have to search your pockets very deep! I’am looking for S4 cases and so far i have found only http://www.caseutopia.com to order some protection cases… better be safe than sorry. I hope someday samsung will produce smartphones with stronger materials. This is the only negative i find on this phone everything else is cool! Dont know if its worth the switch to an Android just to have a phone that I wont have to touch the screen. I know people that have the galaxy phones and my girlfriend had one of the galaxy tablets. ALL of them have laggy screen swipes, buggy OS’s and invasive apps. All the good hardware in the world wont compensate for a lousy OS. Apparently not because the S 4 has many issues and he didn’t mention a single one of them. The moral of the story is don’t count on Gigaom “reviews”. Samsung seems to have their eye on modifying android to the point where touch wiz is in effect the OS. Indeed and it’s a clever strategy. if you like a bloated OS with many features that don’t work well or at all. It’s also ugly with very inconsistent design. But Gigaom wants those Samsung ad dollars so we won’t talk about any of that. Great phone and it will sell millions. However, screen size is my main driver and currently using the note 5.5″ I cannot go below this. Eagerly awaiting for the note 3 otherwise if I cannot hold out for too long, the Pantech Vega 6 is also on my shopping list. On a side note, while using galaxy note 2 using dolphin browser with desktop on all the time, why does only gigaom site always divert to mobile view ??? Really eagerly waiting for this device to be in the hands as this device have amazing features for the users. Hardware is not dual-core, its minimum quad core. and in the international version, its octa-core.